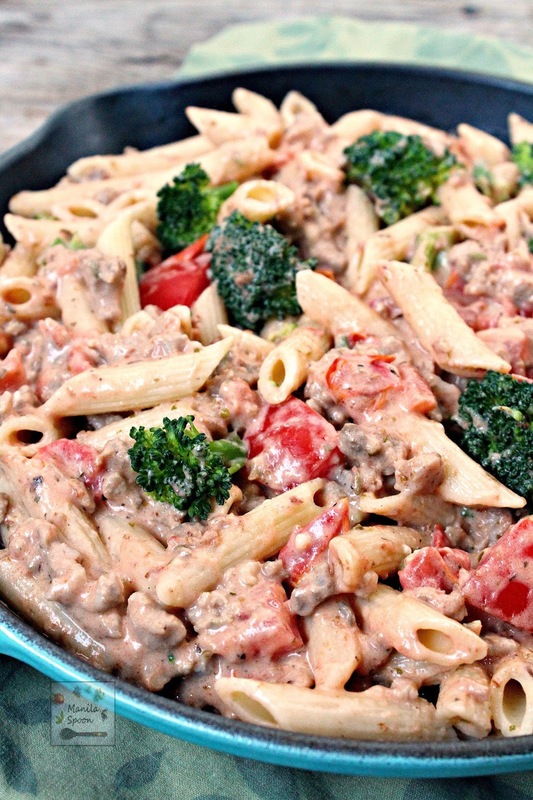 Ready in 30 minutes or less, this delicious Italian Sausage and Broccoli Alfredo Pasta meal makes dinner a breeze for Mom. Just five ingredients is all you need! My family loves sausages. When we resided in Michigan, we lived near a butcher shop so we often got our favorite South African sausage (Boerewors) from them. Oh, how we miss that! Thankfully, here in New Haven we found out that there’s an Italian grocery that sells a variety of delicious sausages. We may no longer have our favorite Boerewors but now at least we have access to good quality Italian sausage. I have always made pasta with sausage as that is comfort food for us and you simply cannot go wrong with it. 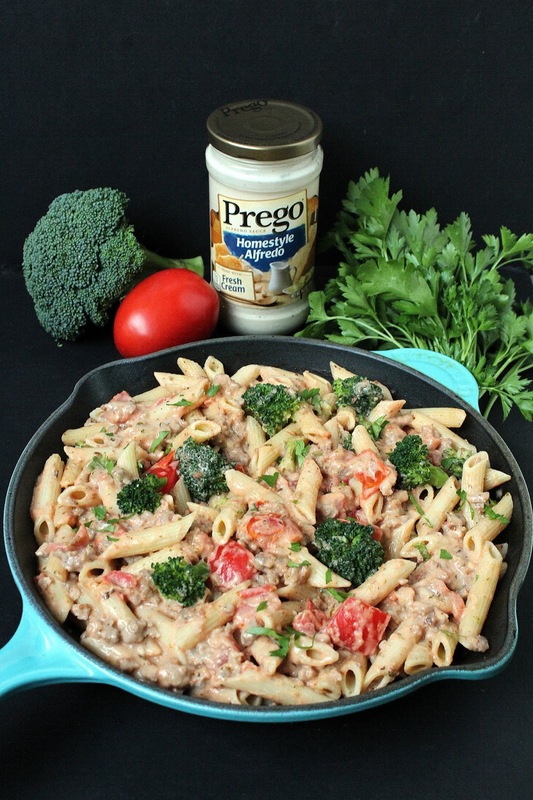 For this post, there was no doubt in my mind that I would make one with Italian sausage as I know through experience that it goes so well with a creamy pasta sauce and for that I’m glad to have Prego Homestyle Alfredo Sauce to the rescue! This delicious sauce is full of flavor and has the perfect balance of garlic, cream and parmesan cheese. 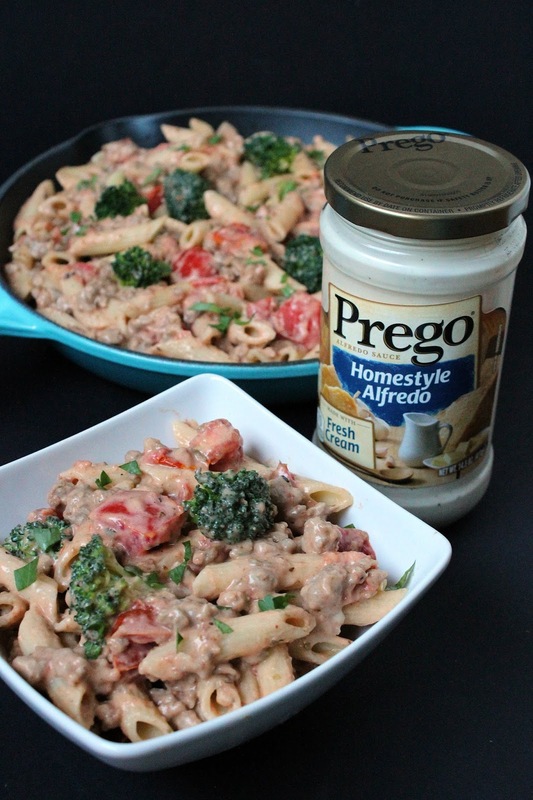 Italian sausage and Prego Homestyle Alfredo is truly a match made in food heaven! Whenever I make a dish for my family, I add some vegetables to the dish so it’s always a balanced meal. It’s not just tasty but also healthy! That is very important. This one dish meal is loaded with tomatoes, broccoli and both fresh and dried herbs – so you know you are feeding your family well with this recipe. Did I mention it’s such a breeze to make? You can make the sauce at the same time the pasta water is boiling so you save a lot of time and all comes together at the end. Here’s how you do it. Simply brown the sausages in a deep pan or large skillet. No need to use oil if the sausage has a little fat in it. When the meat looks nice and brown already, add the dried oregano and tomatoes. Stir and let the tomatoes soften a little. 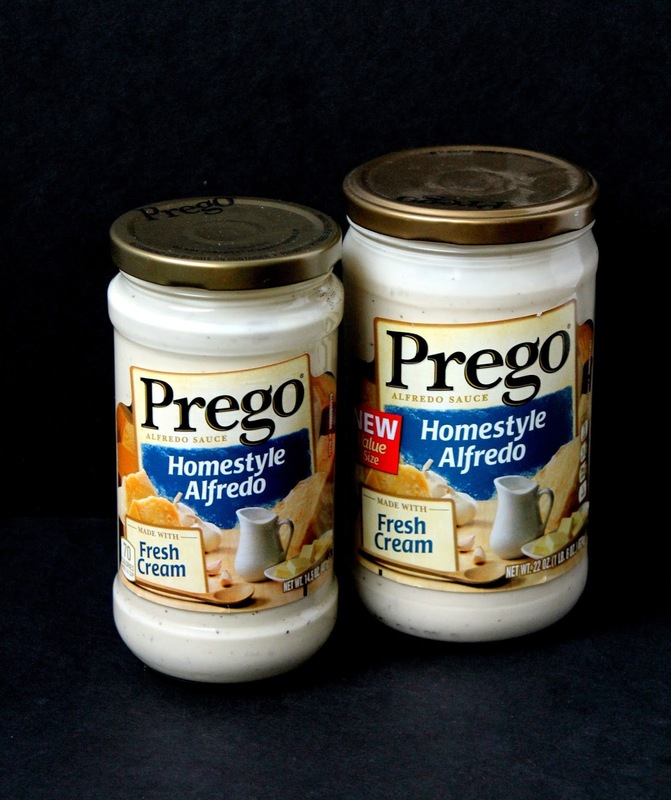 And then add that gloriously creamy Prego Homestyle Alfredo sauce and see how delicious it looks already at that point! Just cook until the sauce is heated through or until your pasta is ready. Then the finale – simply mix the cooked pasta and broccoli (cooked in the same pot as the pasta) and what a lovely and delicious pasta meal you have! All that goodness in less than 30 minutes!!! 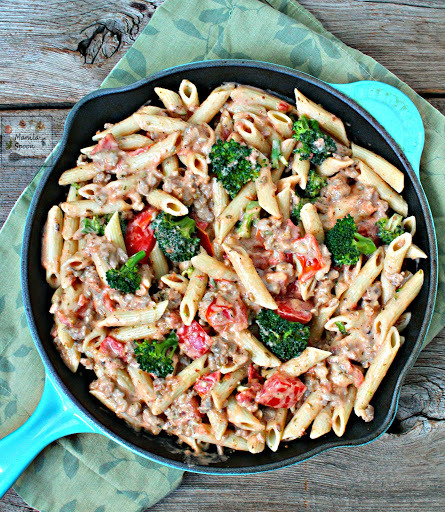 Ready in 30 minutes or less, this delicious Italian Sausage and Broccoli Alfredo Pasta meal makes dinner a breeze for Mom. Just five main ingredients is all you need! Bring a large pot of salted water to a boil. Cook the pasta al dente or according to package directions. During the last 3-4 minutes of cooking add the chopped broccoli florets. When done, drain the pasta and broccoli and mix everything with the finished sauce. While the water boils, brown the sausages in a deep pan or large skillet. No need to use oil if the sausage has a little fat in it. When the meat looks nice and brown already, add the chopped tomatoes and dried oregano (if using). Stir and let the tomatoes soften a little about 5 minutes or so. Stir in the Prego Homestyle Alfredo sauce into the meat. Simmer until the sauce is heated through or until your pasta is ready. Mix the drained pasta and broccoli into the sauce. Serve immediately. Garnish with some chopped fresh parsley if desired. A little bit of parmesan on top would also be wonderful! Anything with Italian sausage is a must in my book. 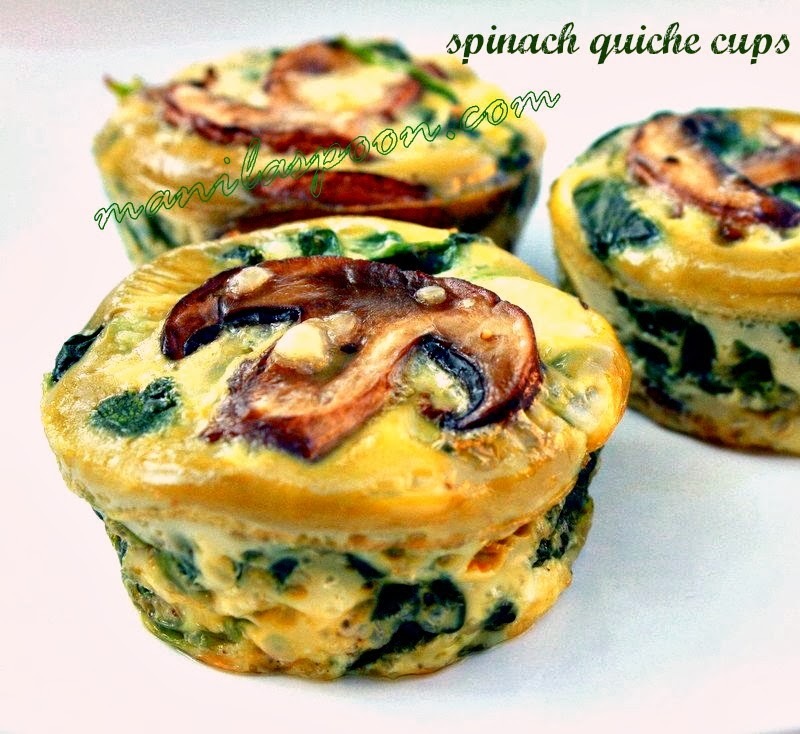 This looks so good – I just had breakfast, but this is making me hungry all over again! Thanks, Sarah! I love sausage in pasta too especially in a creamy sauce like this! This savory and delicious looking sausage alfredo looks just perfect for this cold weather, or for any time! Thanks so much for the inspiration. I hope you enjoy it, Dan! Thanks! My husband is a big fan of sausage with pasta! We also love "cheating" and using store-bought pasta sauces on nights where we want a quick dinner. Looks delicious! I love the convenience of using it, too especially for days when everything gets too busy! Thanks, Kacey! Sausage just makes a pasta dish so much more comforting doesn't it. My husband would love something like this. Hope your hubby enjoys this Dannii! And I agree, sausages make everything delicious! We love broccoli and pasta and you're right it adds a lovely hue and of course makes it healthier, too! Thanks Sara! Such a comfort meal and so easy to make! fantastic. That is so true! Thanks, Florian! That is so true Chrisy! Thanks! I love mixing pasta and sausage! I've never made a pasta-sausage dish with alfredo, and this looks amazing! Thanks for the excellent idea & recipe! You're welcome and thanks Patricia! Dear Abby, this looks so delicious, pass me a fork. My whole family would love it. We especially love broccoli! Great quick, weeknight dinner for fall or winter. Hope you enjoy this Allie! Thanks! My family would definitely love this pasta—and I'd be thrilled that I wouldn't be in the kitchen all day! Please enjoy Liz and thanks for stopping by! Alfredo pasta is my #1 pasta of choice. I've never tried Alfredo sauce from a jar, but your recipe with the added tomatoes and sausage looks so creamy and enticing that I must pick up a jar to try for myself! Please enjoy and hope you like it Kirsten! OI love the Alfredo combined with the tomatoes for a creamy "pink" sauce! This looks amazing! Thanks Dan and hope you get to try this! I hope so Lauren! Thanks for stopping by!